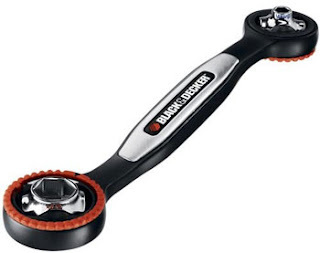 Here is the tool called "bone wrench" from B&D. The purpose of this tool is to use only one spanner but with multiple socket sizes. The edge of this tool is convenient and easy to carry. It is typical DIY tools. The difference between DIY and professional tool is the tool itself usually designed to solve the very specific problem. For example, the extra bend combination wrench can be driving the nut in very confined space. The angle is limited and users can't apply high regular torque. For the tool like "bone wrench", it can't be applied to the above situation. More specific, the bone wrench socket head part is design to be larger than usual spanner, so it can allow different socket replaced. Large head size make it inconvenient to apply in small place. That doesn't mean this tool is not good quality tool but just toward the different market target. That's why Tien-I team listen our B2B customers very carefully before we recommend any products.